Valentine’s Day always seems to sneak up on you, doesn’t it? Does your spouse or significant other expect an elegant night out? If so, the realization that there are just a few days left until the big day can hit you like a ton of bricks. We’re here to save the day! Instead of scrambling to come up with plans so this Valentine’s Day doesn’t become one to forget, here are a few excellent options in North Dallas to make sure it’s one to remember! Steps to Romance, Learn to Dance! Always wanted to learn how to dance with your partner? There’s no time like the present! This fun activity, which is hosted by Maggiano’s Little Italy in NorthPark Center at 7 p.m., includes a two-course dinner for you and your sweetheart. Hors d’oeuvres and a champagne toast are followed by foxtrot lessons. After that, you will enjoy a delicious dinner together. Following the meal, it’s time to take the floor! A second toast as well as a dessert buffet will cap the fun-filled evening. Tickets are $75 per person, or $150 per couple. Perhaps the extravagance of ballroom dancing isn’t quite your speed, but you’d still prefer to keep it classy. With this cocktail-making class from the folks at The People’s Last Stand (in Mockingbird Station), you’ll learn how to make some delicious cocktails with your partner while enjoying some appetizers and champagne. For just $50, you’ll gain skills that you’ll be able to use for a lifetime! And you’ll get to do it together. Email holler@peoplesdallas.com to get more information and a detailed schedule about the class. A haunted house? Yep, this Plano mainstay will open its doors for three days starting on Valentine’s Day. Their holiday-themed production this February is called “Fever.” In this scenario, a deadly virus has broken out, infecting all who encounter it! And you and your date are right in the middle of the nightmare! If traditional Valentine’s Day-related outings aren’t you and your partner’s cup of tea, this may be just what you’re looking for! Tickets start at $37 for the core attraction, but you can pay $10 more to go through “Annabelle’s Asylum” if you’ve got a haunted-house “fever” that just won’t go away. What’s more romantic than a chocolate tour together? Thanks to Dallas by Chocolate, you and your partner can enjoy a private motorcoach tour through several stops around Dallas. You’ll search for the best chocolate in the area, sampling the finest Dallas has to offer. The tickets are just $40, and they include the aforementioned motorcoach and samples, plus some terrific beverages. 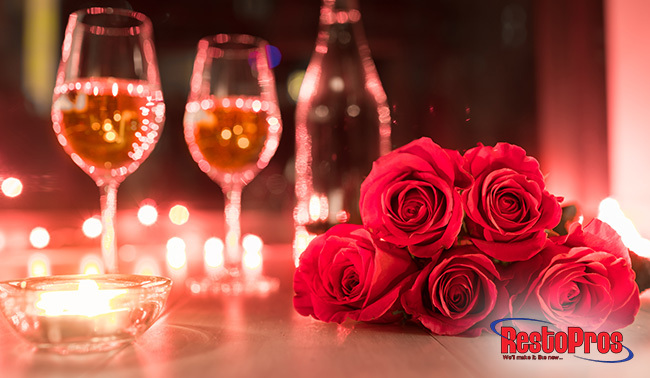 Here at RestoPros, we want to wish you and yours a truly happy Valentine’s Day! We’re proud to call North Dallas our home, and we hope these tips can help you and your partner have a day to remember. And of course, don’t hesitate to call us at 855-587-3786 for any questions or feedback you may have for us. We love to hear from our north Dallas neighbors!